UNEP and Indonesia launch campaign to solve global issue of massive amounts of plastic ending up in oceans. NUSA DUA, Bali, Indonesia—The sun is peeking from over the horizon, greeting early morning beach-dwellers to the sounds of crashing waves, the feel of tropical humidity and the sight of an entire beach covered in trash. While seemingly idyllic, the coastline of Kuta is in reality cluttered with plastic bottles, packaging, straws, cans, old shoes and plastic bags. Tourists who fly in from across the globe to visit the tourist paradise, walk or jog through the harmful waste as it washes in with the waves from the ocean. On the same island, on Friday, scientists, CEOs, entrepreneurs and leaders from public and private sectors began gathering for a conference on the ocean. One of the discussions they are having is how people, countries and companies can solve the global issue of massive amounts of plastic waste ending up in oceans. Against this backdrop, the UN has decided to launch a global campaign declaring war on ocean plastic. It is urging governments to pass plastic-reduction policy with a view to ending marine litter. The Blue Economy, or money generated from oceans and coastlines, is not the only thing that will be catastrophically affected if we continue to allow plastic to enter the ocean the way we are now, something that everyone is equally responsible for, according to Peter Thomson, the president of the UN General Assembly. Professor Ove Hoegh-Guldberg says that it is not about losing just one species but an ecosystem of up to one million species. The catastrophic loss of biodiversity will drain the region`s food security and livelihood, he warns. This is an ecological crisis - and it is threatening not only marine life, but also our health. The plastics that end up in the ocean are consumed by fish that in turn end up on our plate and in our bodies. On a beach in Bali on Thursday morning, the United Nations Environment Programme (UNEP), together with the Indonesian government, announced a pledge to reduce plastic waste in Indonesia by 70 percent by the end of 2025. The reality is that every day nearly 10 million plastic bags are handed out in Indonesia for free. A trial tax on plastic bags resulted in a 50 percent reduction in plastic waste last year. However, Siti Nurbaya, Indonesian environment minister, said that businesses and traders were complaining about the tax. How then is it possible to implement the change? The solution is seemingly easy - to stop using plastic altogether. The reality is different. In Indonesia, there is a lack of awareness when it comes to trash, which is why a national education programme is being introduced into the curriculum as one way to tackle waste. But the problem goes far beyond education and starts at a much higher level in business and politics. 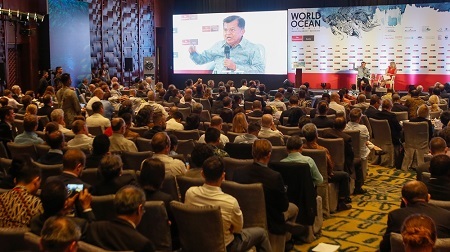 The World Ocean Conference has brought several international bodies together. The goals are in place but the discussion is far from over. Photo on front page: Trash washed up on the sea shore. Source: Al Jazeera. Photo on this page: Indonesia`s Bali, a tourist paradise, is hosting the World Ocean Summit. Source: Made Nagi/EPA.